Although my recent trip to South Africa was to look at the Permian turbidites, we couldn’t resist a short stop to check out the underlying glacial tillite of the Dwyka Group. The Dwyka is Carboniferous to Permian and was deposited during the glacial cycles that affected this part of Gondwana during that time. The well-known cyclical coal measures of the mid-continent of North America and Europe are roughly equivalent. Tillites are readily recognizable from their very poorly sorted mixture of grains, pebbles, and boulders of various rock types in a fine matrix. The clasts are commonly angular producing a breccia-like appearance. If you happen to know more about this particular formation or glacial deposits in general (not my specialty), please feel free to chime in below. ← Anyone going to San Antonio? That is the Dywka Group (Carboniferous). Although it is commonly called a tillite in south africa, it does not meet a strict definition of tillite as it is not in fact a lithified till. It was deposited in liquid water in a glacialy-influenced basin. I am promoting the use of “Dwyka diamictite” although it has clearly not caught on as of yet! It could have been marine, was probably covered by ice at least some if not all of the time, and contained strange and very large sea scorpions (2m eurypterids). All the recent posts about jargon (old and new) has got me thinking – maybe we need a new term which incorporates both the textural (e.g. diamictite) and the genetic (glacial), which could replace “tillite” which is currently serving as a misnomer. How about “dwykite”? Christie … thanks for the input. That is a good point, we were calling a tillite, but were also discussing how it was interpreted to be subaqueous deposition. Hmmm … dwykite … rolls off the tongue nicely. Are there any faceted and/or striated clasts in the mix? Christie — Why liquid water? Are there clear dropstones? Whatever you all end up calling it – and sometimes a non-genetic term is best, and dwykite for the new genetic implications sounds good to me – I love the photos, and I collect “breccias” of all types. I guess I’ll have to program the new term into Word’s spellchecker! (see Kim’s post). Hey, glad you all seem to like “dwykite”. The Dwyka Group (which only has one formation, so nearly always called Dwyka) is subdivided in the Laingsburg area of the little Karoo into basically 7 members – not sure if these are similar in the Tanqua Karoo. There are two general lithologies – a “course” (pebble to boulder-bearing) diamictite with massive silty/mud matrix (probable glacial “rock flour” I think. Rarely these have bedding/lamination but generally completely featureless matrix. … 3c, 3f, 4c, 4f are lighologically similar to “c” and “f”s down section. 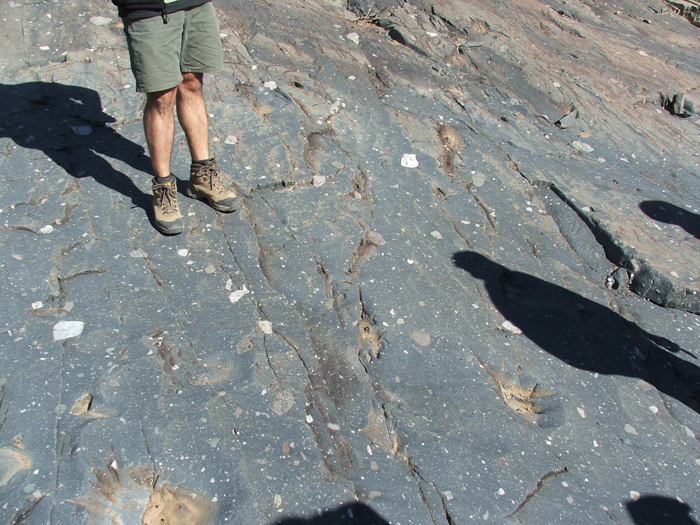 REally cool oblong concretions – mostly phosphatic core and dolomitic cement mantle – occur in the 3f and 4f. there are supposed to be faceted/striated clasts, but I have only seen one (a large boulder). Complicating things – I have documented that the cape-fold-related axial planar pressure solution cleavage, and a possible post-folding fracture cleavage both manifest rather strangely in the dwyka. The cleavages are strong in many clasts but invisible in the matrix. I haven’t thin sectioned the matrix but i think this reflects the mineralogical immaturity at time of deposition, e.g. low in clays. This makes some clasts look faceted – but if you look around carefully at clasts in situ you see that each “faceted” face is parallel to the rest, and parallel to the axial planes of the folds. therefore I suggest that the number of true faceted clasts may be overestimated. However, the composition of clasts (combined with their size) leaves no controversy that they were glacially transported. I desperately wanted to collect a very obvious boulder of Barberton BIF from the dywka at Laingsburg – but it was probably 50kg and not at all close to the road. It had to be transported 1000s kms. 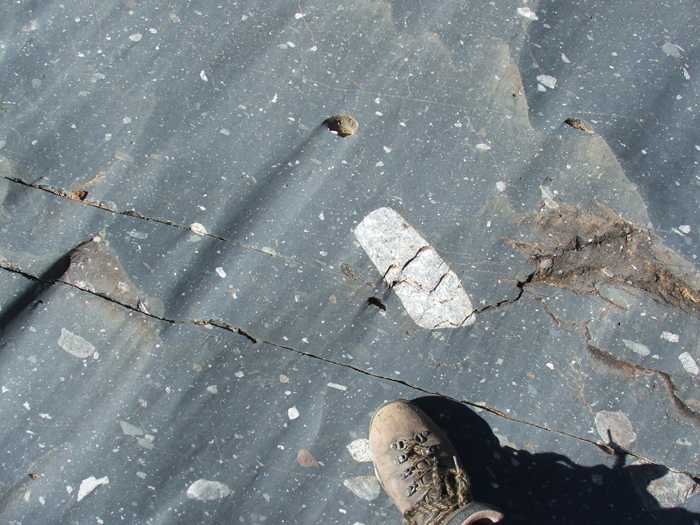 Re clear dropstones – rare, as clasts are common in massive matrix where there is no bedding to show the “drop”. My colleague knows of one fantastic and very large one which he takes the students to see. The “fine” members are planar laminated and I have never seen any deformation (not even bioturbation or soft sed structures) in these members. As I’ve already written about this a bit but had forgotten about it! Christie … awesome! Thanks for all the info. One general question, what’s the timing of deformation in the Cape Fold Belt? Timing of Cape Fold is carboniferous-Permian – initiated during the deposition of the dwyka. I am writing a paper on some conglomerates in the Permian-Triassic Trinity Peninsula Group of the Antarctic Peninsula. These are not glacial but may be derived from erosion of older galcial deposits, possible marine glacials near the shelf edge (the sediments are probably Triassic). I am looking for information on the sizs and composition of the more common clast in the Dwyka. I see you have photos with large boulders but I can’t tell what they are. Do you have a high proportuion of quartzites and granitoids? John … I’ve only seen these rocks once (for about 20 minutes when I took these photos) … but ‘christie’ who commented above knows quite a bit. I suggest following the link she provided to her blog discussing the Dwyka in more detail.